Growing up in Hermiston, Oregon as a daughter of two Mexican immigrants wasn’t a foreign experience for Carina Garcia — Hermiston’s population is 36 percent Hispanic, higher than most Oregon cities. But Garcia now wonders whether she is welcome in Eugene as Initiative Petition 22 (IP22), a proposal that would repeal Oregon’s 30-year-old state sanctuary law, targets Oregon’s Hispanic population. The law prevents state and local law enforcement, along with federal government officials, from actively partaking in the arrest and deportation of people whose only crime is breaking federal immigration law. The catalyst behind the IP22 campaign is Oregonians for Immigration Reform (OFIR), a group that the Southern Poverty Law Center (SPLC) has designated a hate group because of its strong ties to white supremacist organizations. But Garcia has never been a stranger to racial profiling, even in a city like Hermiston where there’s a strong Hispanic presence. Garcia’s work experience at fast-food restaurants and gas stations as a teenager gave her a window into anti-immigrant perceptions, specifically toward Hispanics, which typically came from her co-workers: As a junior in high school, Garcia’s co-worker at McDonald’s complained about immigrants illegally coming to the U.S., claiming immigrants are “freeloaders” who bring only trouble to the community. “She was telling all of this to my face while I was at work, and I really didn’t know what to say because she was older and I was younger, I didn’t understand the power dynamics and didn’t want to make a scene,” Garcia said. Events like these remind Garcia of the feeling of being muted and not having the ability to speak up. “If I ever get the chance to confront her again, or another similar situation, with the knowledge I have now, I will not be silent,” Garcia said. Her experiences have propelled her to join and continually volunteer for Causa Oregon. In light of IP22, Causa Oregon, along with Asian Pacific American Network of Oregon (APANO), increased its activities to stop the initiative from getting on the ballot. 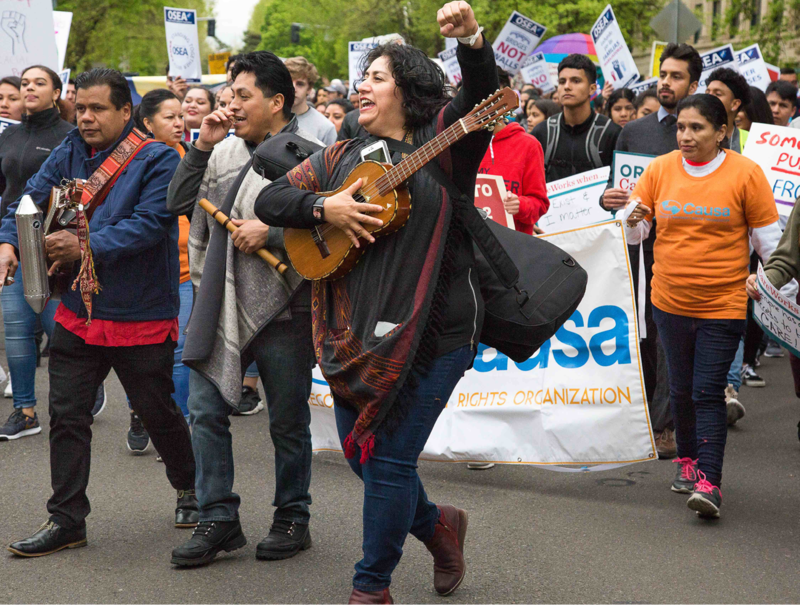 Immigrant rights organizations like these focus and provide assistance to Oregon’s Latino and immigrant communities, including undocumented immigrants. According to Causa Oregon and APANO, repealing Oregon’s sanctuary law would bring society back to a time when racial profiling was even worse than it is today. Both groups aim to protect immigrants in Oregon from a growing national anti-immigrant sentiment exacerbated by the Trump administration. It was 2015 and similar situations of intolerance that Garcia experienced in her hometown followed her to Eugene. But it didn’t bother her as much. Instead, she felt lonely. Not only was she new to Eugene, but she had just started attending the University of Oregon (UO) the same year. Garcia didn’t see “familiar faces” in the city, as those identifying as Latino or Hispanic account for only 8.5 percent of the population in Eugene, compared to 36.8 percent back home. 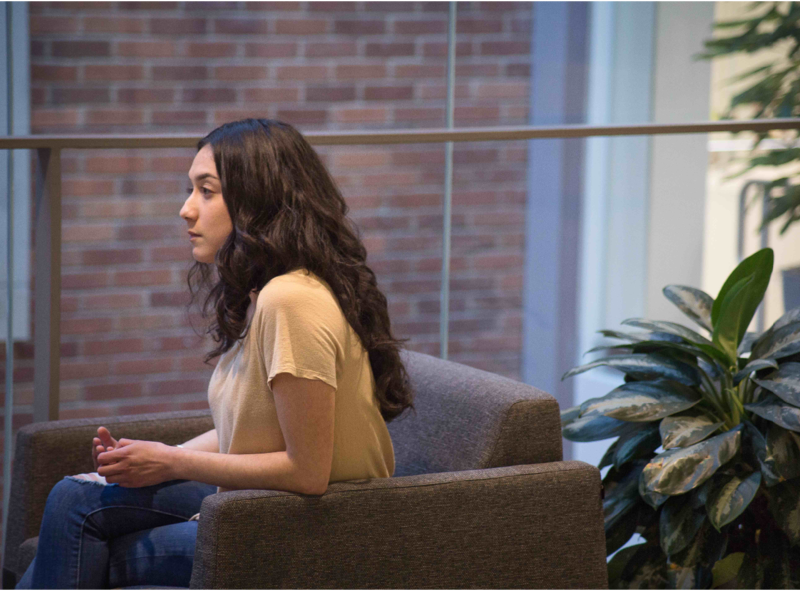 But she didn’t give up and complain over the struggles she was experiencing when it came to connecting with people and instead channeled her energy into joining student groups on campus. As an international studies and sociology major, she wanted to branch out — Garcia joined MEChA, a student union group serving students with a Latino or Hispanic background, and immediately got involved in its activities. It was her first opportunity to join an organization that focused its work on social justice. She also enrolled in a Spanish class through the Spanish Heritage Learners program at UO. The program aims to immerse students who grew up in Spanish-speaking households or neighborhoods in the U.S. in lessons that touch on Hispanic culture and heritage. Garcia noted her involvement in both activities opened her eyes to contemporary struggles facing the Latino community and also connected her to her cultural roots. Then, an opportunity to organize the annual Raza Unida Conference at the UO arose. 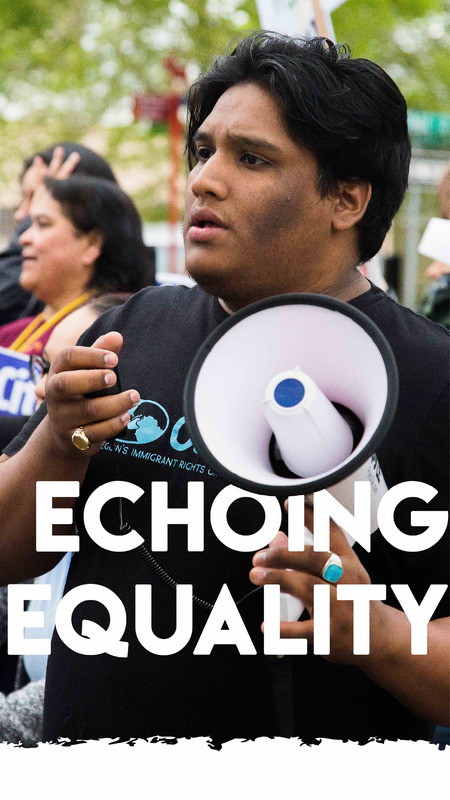 The conference invited Latinx (a gender-neutral term for Latinos and Hispanics) students from Oregon to participate in workshops and hear from keynote speakers on issues affecting disenfranchise Latino and Hispanic communities. “It was through the conference I met with a representative from Causa Oregon, Oregon’s Latino immigrant rights organization, and felt my goals as an individual aligned with their purpose on advocating for social justice,” Garcia said. “After he spoke to the students, I knew [Causa Oregon] was for me. After completing an internship with the organization, Garcia still volunteers for the group’s events and gatherings. At the moment, most of those events are geared toward warding off efforts to repeal Oregon’s 30-year-old sanctuary law. 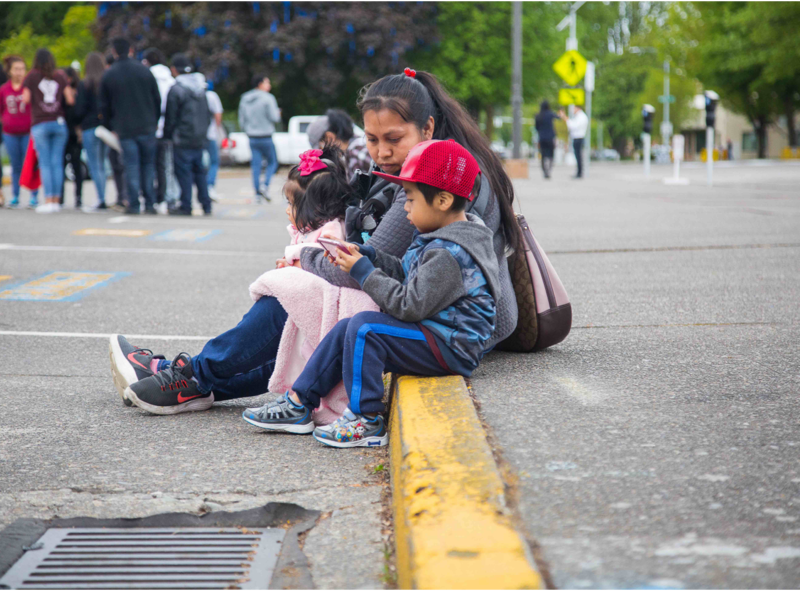 Joel Iboa, a coalition coordinator for Causa Oregon, and Robin Ye, a field organizer for APANO, both see OFIR using Oregon as a “testing ground” for its anti-immigrant policies. Both groups belong to the One Oregon coalition and each member of the coalition advocates for immigrants’ rights independently. According to Garcia, IP22 aligns with President Donald Trump and Attorney General Jeff Sessions’ campaign to curtail states abiding by sanctuary law by slashing their funding. The possibility of IP22 appearing on the November 2018 ballot is a reality. Since May 2017, OFIR has started reaching out to anti-immigrant hate and white supremacy groups across the nation asking for financial and logistical support. According to Hatewatch, a SPLC blog that monitors and exposes hate groups throughout the U.S., OFIR has a track record of remaining persistent in repealing immigrant-friendly policies in Oregon. Also both Causa Oregon and APANO note that “it’s cheap” to get a measure on the ballot in Oregon, meaning it only takes 88,000 signatures, compared to 259,622 signatures in Washington, and 585,407 signatures in California. Because of this, thwarting attempts to repeal Oregon’s sanctuary law represents a key concern, not only for Garcia, but also for leaders of Causa Oregon and APANO. The concern stems from 2013 when former Governor of Oregon, John Kitzhaber, signed SB 833, which allowed undocumented immigrants to get a drivers card and, according to Iboa, was a response to an increased amount of police arrests of undocumented immigrants driving without a driver’s license. Kitzhaber’s action prompted OFIR to begin campaigning anti-immigrant sentiments to defeat Measure 88, which would have allowed immigrants to obtain driver’s cards without proof of legal presence in the U.S. The eventual rejection of Measure 88 in 2014 jumpstarted One Oregon’s formation and focus on racial and social justice work. As Iboa puts it, the success OFIR had with the defeat of Measure 88 prevented many undocumented immigrants from enjoying the basic necessity of having a car, including barring them from going to work. OFIR, according to its website, announced the “Stop Oregon Sanctuary Cities” plan in early May 2017 and will need 88,184 signatures by July 2018 to be eligible as a measure in the November ballot. A mother with her young children observes the day’s activities from a quiet curb. In 2017, May Day protests in Portland, Oregon turned violent when protesters and riot police clashed.